I needed to fill a couple of hours before bed last night, but didn’t want to jump into any game where I might still be stuck in the tutorial when I needed to wind it down for the evening. 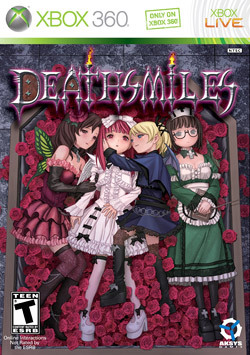 It turned out that “Deathsmiles”, Cave’s goth-loli-themed bullet-hell shooter from a few years back, was just what I needed. If you don’t mind hitting the continue button when you die, you can blow through it in 45 minutes or less, which means that I actually played through all four main characters’ stories and will go back tonight to play through them a second time to see their other endings. I may even try to 1cc it, because I felt like I was actually getting better on each run. I did find a little bit of shame on what was in the big Special Edition box along with the game, because, well, it’s a replacement Xbox360 faceplate, covered in cute anime-style girls, that only fits an old-style 360. This thing is probably the least-useful swag I’ve gotten in an SE ever, and I pray that I didn’t include it in my purchasing decision back in 2010, because that would just be embarrassing.